Ok so this isn't an original idea here, you can buy eco friendly reusable sandwich wraps and snack bags at health food stores and eco stores, which I did do during my pre-children pre-uni, working days when we actually had money, but really at this point in time I cannot justify paying $11 for one when I know I could make them for far less. I already had two for the kids that I bought from Todae, which is a great eco store but I really wanted to have one for myself and Jeremy. This is the simple way that I came up with to make them and they really took no time at all. Step 2: Pin velcro to each piece of oil cloth. For the sandwich wrap pin the velcro in the corners on the diagonal. 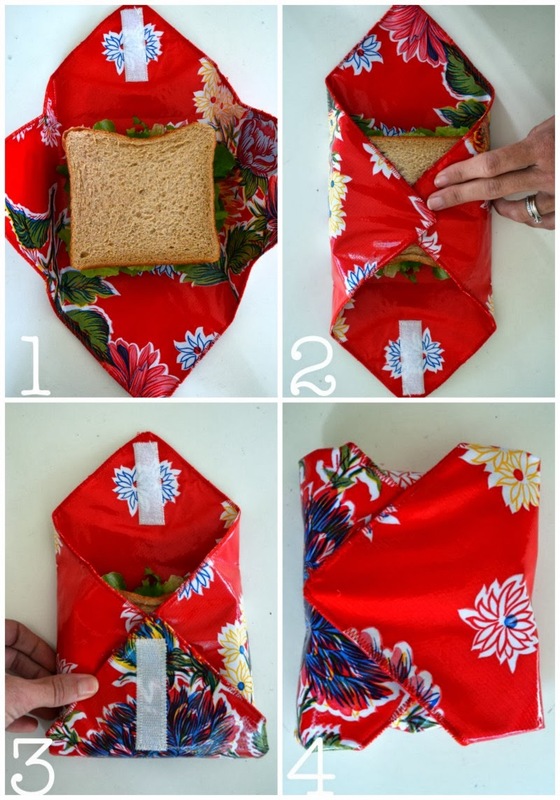 For the snack bag, pin one velcro to one short end of each piece of oilcloth. Step 4: Place the two square pieces (sandwich wrap) of oilcloth right sides together and pin along the edges. Repeat with the rectangle pieces (snack bag) but REMEMBER when pinning right sides together, to make sure to have the velcro at either end (so not together at the same end). Step 5: Sew around the edges of both the sandwich wrap and snack bag, but leave a 2 inch opening so you can turn them right side out. Step 6: Turn the sandwich wrap and snack bag right side out. For the sandwich wrap pin the opening closed and zigzag stitch around the entire edge. Step 7: For the snack bag, pin the opening closed and then fold one end up so that it is 16cm long and the other is 19cm (giving a 3cm over hang to close the bag). Then zigzag stitch around the edge of the entire bag. That's it! Simple and quick. Now you can enjoy your lunches and know that you won't have any plastic bags or paper to dispose of. Win for you and the environment! To clean, simply wipe down with a damp dish cloth.